When it was introduced at the turn of the millennium, the euro was widely perceived as a major achievement for Europe. The apparent economic successes, coupled with cross-country convergence of several economic indicators, fueled this sentiment of success. A couple of years later, the picture looks dramatically different. The world financial crisis has revealed imbalances that have led to the sovereign debt crisis and brought the euro area on the verge of dislocation. The austerity policies that became the norm on the continent in 2011 fueled a protracted stagnation , with growth rates that look bleak in comparison to the United States and the United Kingdom. This economic underperformance has fueled popular resentment against the euro, now seen by a growing number of European people as the problem rather than the solution. The financial community itself seems to be prepared to the possibility of an exit or a dissolution of the single currency by cutting back on cross-border positions. Greece was on the verge to leave in 2015. And the intellectual mood is also shifting: leading thinkers, such as US economist Joseph Stiglitz, or German Sociologist Wolfgang Streeck are among the most visible figures of a wider change of attitude. A country exiting the euro, or even the dissolution of the single currency, has therefore become a concrete possibility. Such an event would obviously have a major impact in several dimensions. On the economic side, the most obvious consequence would be the changing conditions in products markets due to the new exchange rates; uncertainty would prevail in the short run, but in the longer run the possibility of adjusting nominal parities would help with the unfolding of current account imbalances. There however exists another impact, less discussed, but potentially more disruptive: the changes in the balance sheet position of economic actors, resulting from the currency redenomination process. This process could introduce significant currency mismatches between the asset and liability sides. Assessing the unfolding of these balance sheet effects is crucial, because they could affect financial relations, investment and trade, have unexpected redistributive effects and, if not adequately managed, lead to productive disruption. The concrete questions that we ask are the following. If a country exits the euro and depreciates its new national currency, what will be the consequences for domestic economic agents which have liabilities denominated in euros: will they be able to repay in the new national currency? and if not, will they be able to avoid bankruptcy despite the increase of their debt burden? Conversely, what are the consequences for exiting countries whose new currency appreciates and who have accumulated foreign assets? In a recent research paper, we propose such an assessment of the redenomination risk in the euro area, by country and by main institutional sector, for two scenarios: a single country exit and a complete break-up. Our analysis relies on the concept of “relevant” liabilities and assets: those are the balance sheet items that will not be redenominated into the new currency after the exit, because of legal or economic reasons. In practice, the most important factor for determining which debt or assets are “relevant” is their governing law: if a financial contract is governed by domestic law, the chances are high that the government of the exiting country will be able to redenominate it into the new currency, by simply passing a law in parliament. Conversely, contracts under foreign law (typically English or New York law) will remain in euros—or be redenominated in some other foreign currency if the euro disappears. In the first case, the lender bears the economic loss; in the second case, the risk is borne by the borrower whose debt burden is increased, unless she decides to default and therefore to impose losses on the lender. 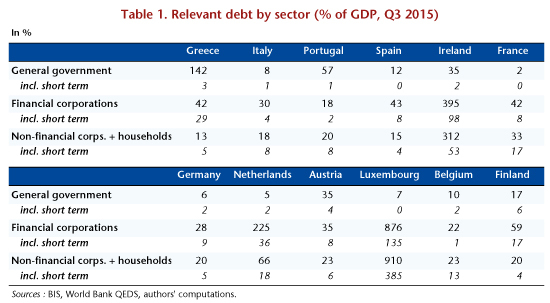 Focusing on the liability side, Table 1 presents our estimates for the relevant debt, by country and institutional sector. It therefore gives an estimate of the exposure of the various sectors and countries to a euro-exit followed by a depreciation. Since the first months after a euro exit will be the most critical, potentially with an exchange rate overshooting, the short-term component of the relevant debt is also reported. On the side of public debt, the countries most at risk are Greece and Portugal, since they have large external loans that will have to be reimbursed in euros. Conversely, France or Italy are quite safe on their public debt, because almost all of it is under domestic law and can therefore be easily redenominated into Francs or Lira. The financial sector is more exposed, especially in countries acting as financial intermediaries like Luxembourg, the Netherlands or Ireland. The exposure of the non-financial private sector looks much more limited (and due to data limitations, the figures are overestimated in countries with a highly developed non-banking financial system). However, relevant liabilities are not the whole story. Relevant assets also matter: for countries which are expected to depreciate (typically southern countries including France), those help mitigating the debt problem, since assets in foreign currency will become more valuable in the domestic currency; conversely, in the case of a currency appreciation (typically northern countries), it is from the asset side that difficulties can arise. The figure shows our estimates for relevant net positions, i.e. for the difference between relevant liabilities and assets. A positive number means that a depreciation will improve the balance sheet, while an appreciation will deteriorate it. The striking fact is that, for most countries and sectors, the relevant net position is positive. This means that northern countries can make a significant loss on their foreign assets if they leave. 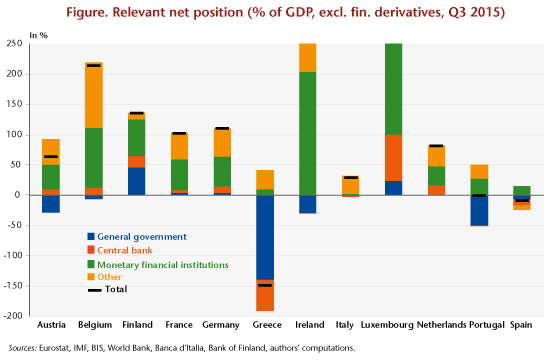 Conversely, for southern countries and France, there is no aggregate balance sheet risk for the private sector (except for Spain), and even no risk for the public sector in some cases. This does not mean that there is no problem because, at the micro level, the holders of the relevant assets may not be the same as those of the relevant liabilities, but at least there is room for maneuver. 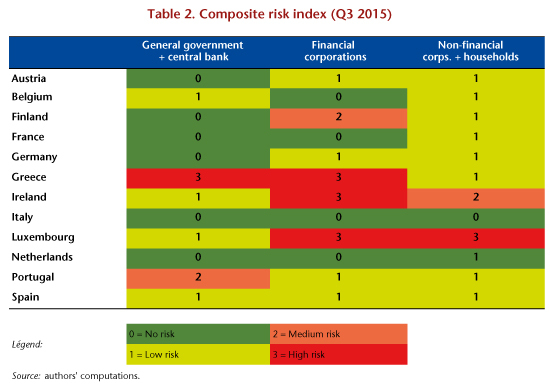 In order to give a broader picture that takes into account the fact that assets can mitigate liabilities problem—but only to some extent—and that short-term debt is the most critical issue, we have constructed a composite risk index that synthesizes all these dimensions, as shown in Table 2. In particular, this indicator was constructed using estimates for the expected exchange rate movements after the exit from the euro. Though this exercise necessarily entails some arbitrary thresholds, it helps identifying a few specific vulnerabilities: the public debts of Greece and Portugal, for which a substantial restructuring or even a default would be the likely outcome; the financial sectors of Greece, Ireland, Luxembourg, and potentially Finland, which would have to undergo a deep restructuring; and potentially the non-financial sector of Ireland and Luxembourg, though that latter result may be an artifact caused by our data limitations. The broad conclusion that can be drawn from our analysis is that, even though the problem of balance sheets is real and should be taken seriously, its overall order of magnitude is not as large as some claim. In particular, in the non-financial private sector, the issue should be manageable provided that proper policy measures are implemented, and disruptions should in that case be limited. Assessing the costs of a euro exit obviously matters for properly dealing ex post with the event, if it were to materialize because of some unexpected political or economic shock. But this assessment is also interesting from an ex ante perspective, especially for a country which is considering whether to leave or to stay. In this respect, our analysis leads to a somewhat unexpected conclusion: the costs are probably not so high for some deficit countries (Italy, Spain), while they are higher than usually thought for surplus countries who could suffer capital losses through depreciations or defaults. The awareness of this fact should give a stronger bargaining power to southern countries in their negotiations with northern countries concerning the future of the Eurozone. See the independent Annual Growth Survey (iAGS) reports.